Drew Estate touts the Acid Roam as their creamiest Acid cigar to date, and the Roam’s silky Connecticut wrapper is cured in oak casks for 150 days prior to rolling, adding toasty and woody character to its smooth profile. The medium-bodied Roam is a prime example of Acid’s off the wall infusions, offering a smooth, sweet, and intoxicating profile that defies thorough description. Since I started smoking fine cigars, I have smoked more of a variety than I can count. 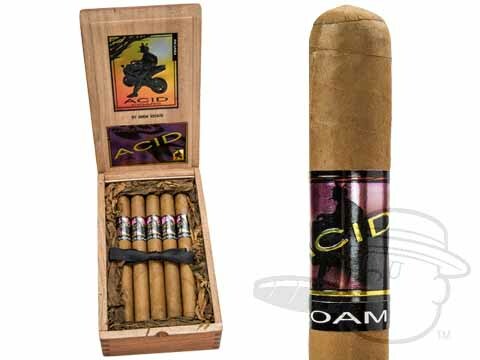 I was hooked on ACID cigars after a friend gave me a Kuba Kuba. I didn't think I'd find a better cigar. Thank goodness I tried the ACID Roam. It is the smoothest, best tasting, most pleasant cigar I have found. I have tried many cigars even after I found the Roam, but I'm not looking anymore. The ACID Roam is the best for me. I will keep a few Kuba's in my humidor along with one or two other cigars, but the Roam will always be my favorite. If you like ACID cigars and haven't tried the Roam yet, you'd better give it a shot. I can not say enough about how good this cigar is. My wife and I bought a box of these because of the review someone else wrote. Now I'm back to confirm that this is a great cigar. Smooth smoke with a little sweetness that the wife likes. Acid Roam has become my NEW favorite! Slow and steady burn with easy draw makes this hard not to enjoy on these warm summer evenings and weekends. Just wanted to update my review because I only gave 4 stars in my first review. Wanted to come back and give 5 stars because after 4-5 years, this is still my most favorite cigar. Acid Roam is rated 4.8 out of 5 based on 13 customer ratings.